Fifty States in Sixty-Four Years! I have now reached my goal of visiting all fifty states in the US, but I am proud to say it has taken me sixty-four years to do so. That means I have actually had a reason to visit. Not just for the sake of tagging a cut-out image on a map. That means I actually spent time there, not just connecting on a flight, or driving across the state line, stepping out of my vehicle to touch ground, and driving back. I can’t think of a single state that I didn’t at least overnight in, visit a famous landmark, try the local cuisine, or figure out what the state was proud to show off as their featured attractions. Okay, well, maybe Kansas. I went there for a business trip back in the 90’s. Sorry, Kansas, if I slighted you. On to my 50th state…Wisconsin. What a difference it is, crossing over that mighty Mississippi River, leaving behind the ninety degree right angles of the golden cornfields of Iowa, and entering the rolling lush green hills and dairy farms of Wisconsin! So beyond tagging my 50th state, what brings me to Wisconsin? 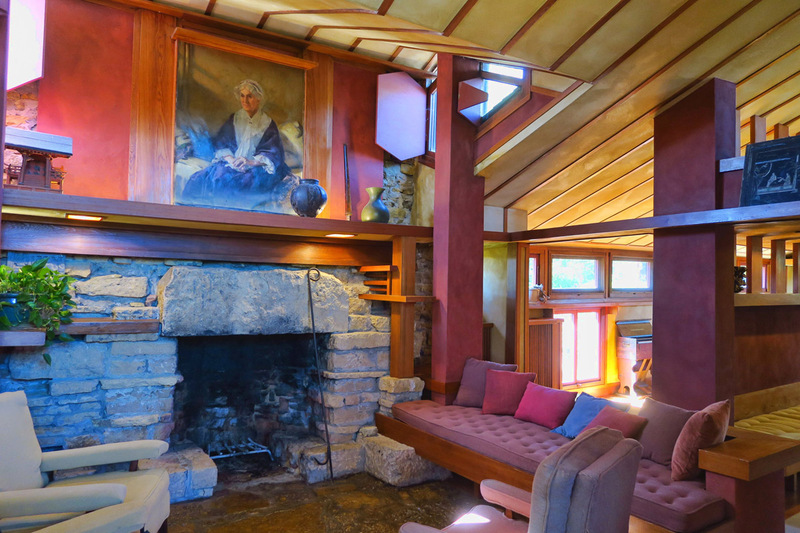 Well, as you’ve no doubt figured out by now, I’m a big fan of Frank Lloyd Wright. 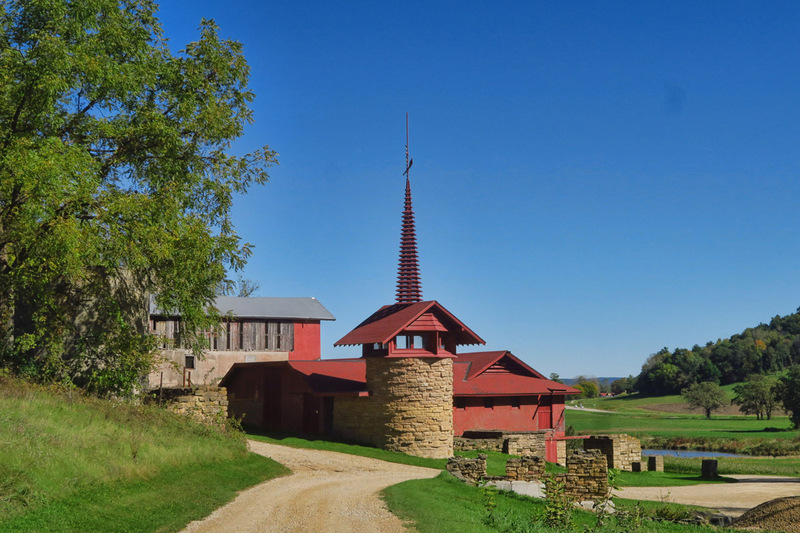 Having visited his designs in Buffalo, Pennsylvania, Arkansas, Scottsdale, Manhattan, and most recently Iowa, it was high time I visited his primary home and work studio in Spring Green, Wisconsin…Taliesin. 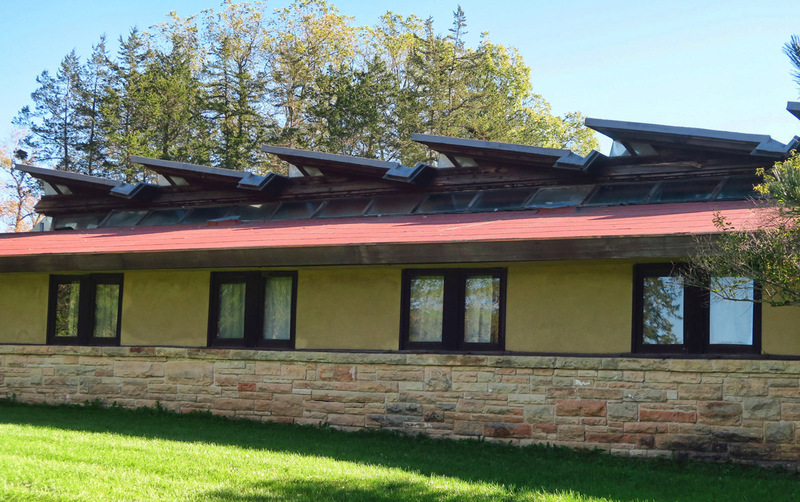 Who knew there was a Frank Lloyd Wright “trail?” Wish I had an extra month to explore it. 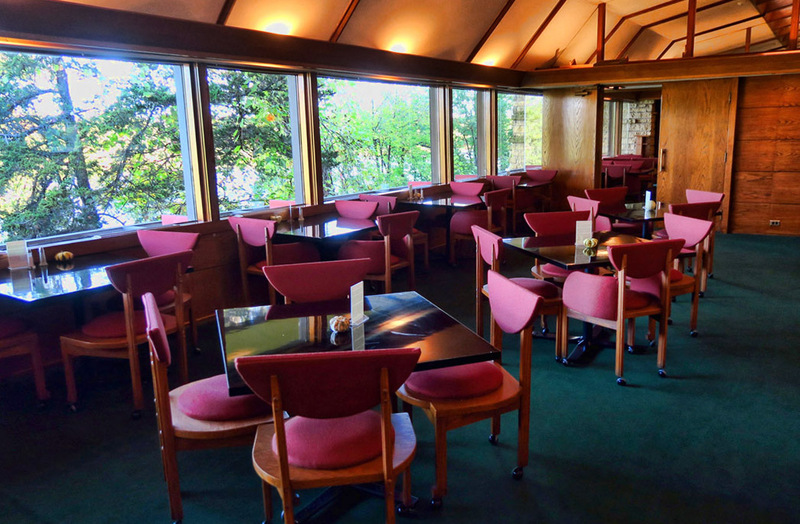 The Riverview Terrace, 1967, is a lovely spot to have lunch after a tour. I had a delicious “farm fresh” burger and a cold craft beer here. Wright grew up in the Wisconsin River Valley, having been born from Welsh parents, which is the reason many of his favorite places had Welsh names. 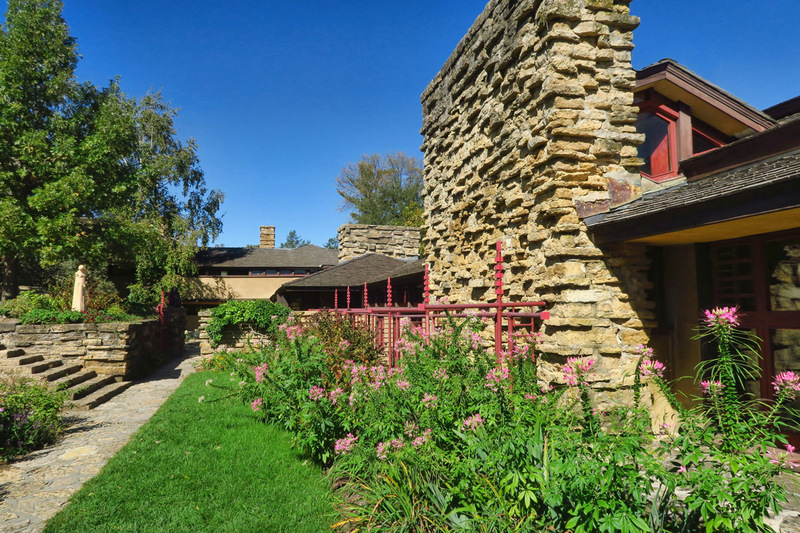 Taliesin means “Shining Brow” in Welsh, an intended name for his home to stand out among the rocks in the bluffs in the surrounding hills. 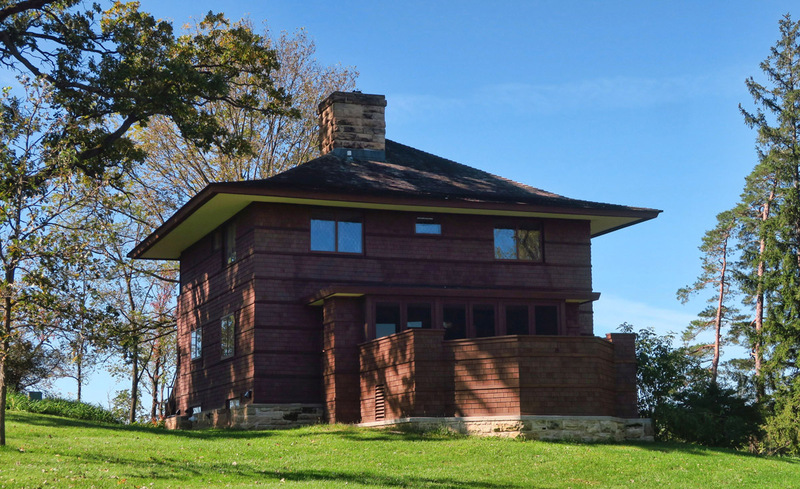 The Estate Tour begins with the Hillside Home School, built in 1902 for his two aunts. 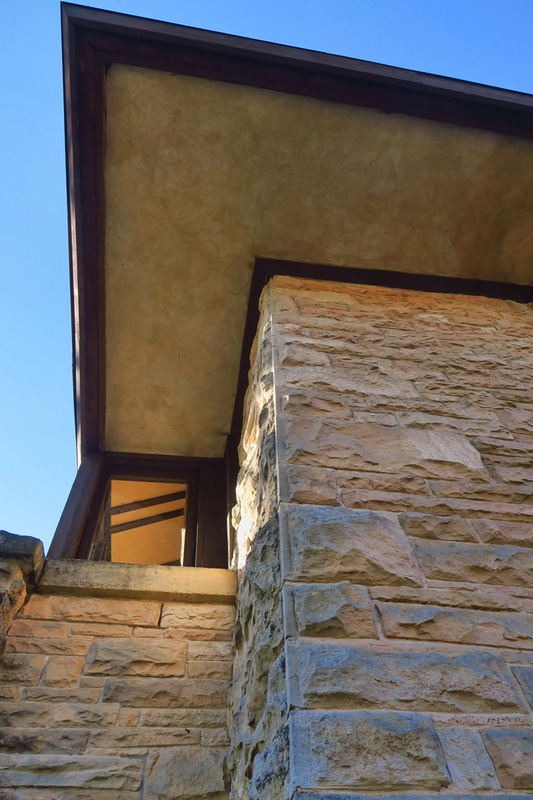 Wright is sometimes known for his “fanaticism,” evident in the stonework of this 1902 construction. 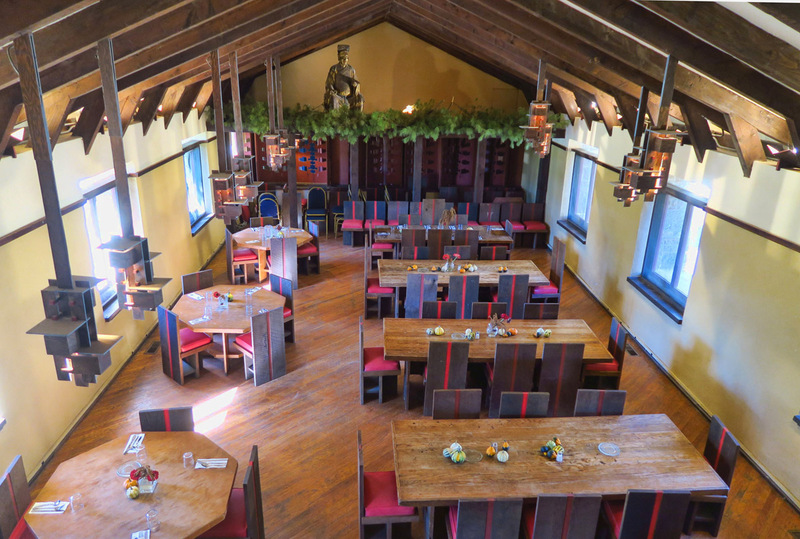 Architectural students each get a turn at arranging the dining hall for special event planning. I decide to splurge on a full four hour Estate Tour, at a jolting price of $84, but I want to see it all, as it’s not likely I’ll pass this way again. I also book the first tour of the day, as I have learned it pays to be on the first tour to get out ahead of the masses. 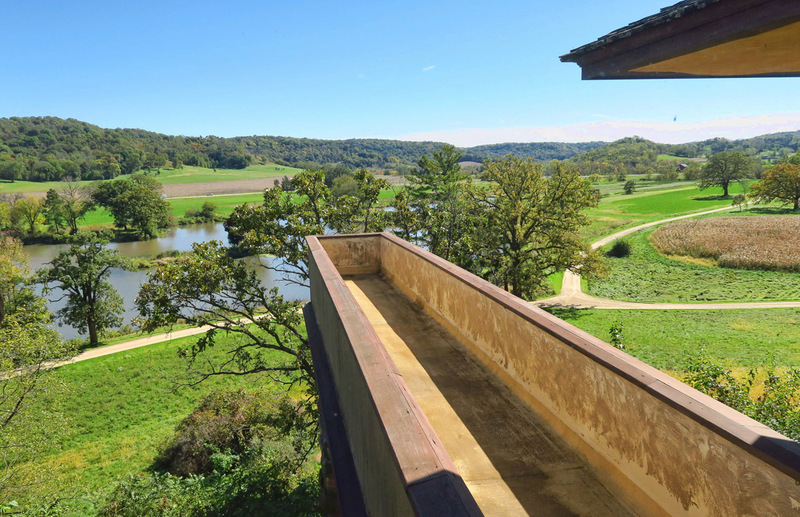 In addition to touring Wright’s home, the Estate Tour includes a walk about on the grounds, as it visits not only the home, but the other buildings on the property. It’s been raining every single day since I left Forest City, so what a treat to wake up to blue skies for the tour on this quintessential fall day! 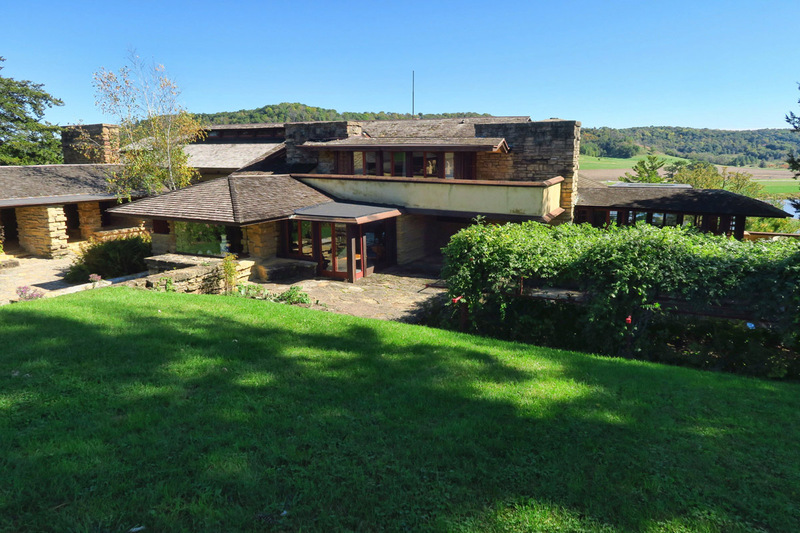 The 800 acre property was first established in 1902 with the Hillside Home School Wright built for his aunts. You may recall, it was the affluent parents of two students of this boarding school that brought Wright’s designs to Mason City, Iowa. 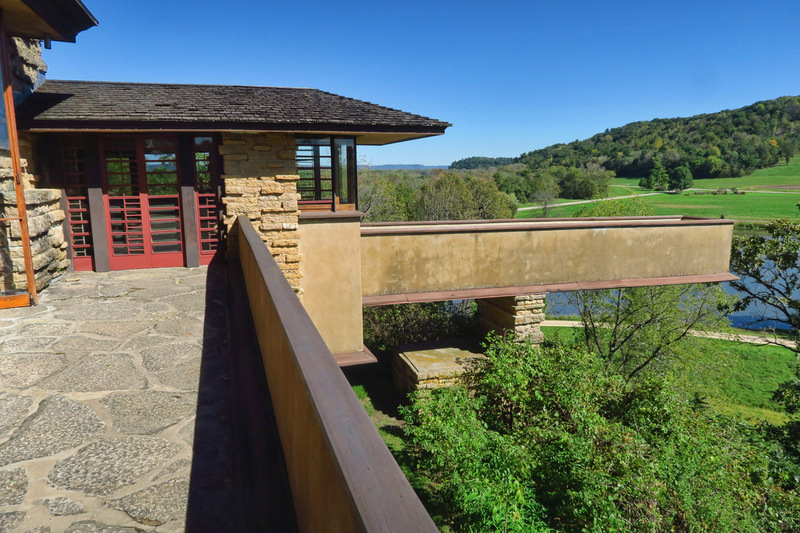 The Hillside School is now home of the Wright School of Architecture, a Masters level program where 20 students in residence spend a summer here and winter in Taliesin West in Scottsdale. In the fifties, the school was expanded to include a dining Hall and theater, still used for concert venues today. The school also has a museum room, housing documents and artifacts. 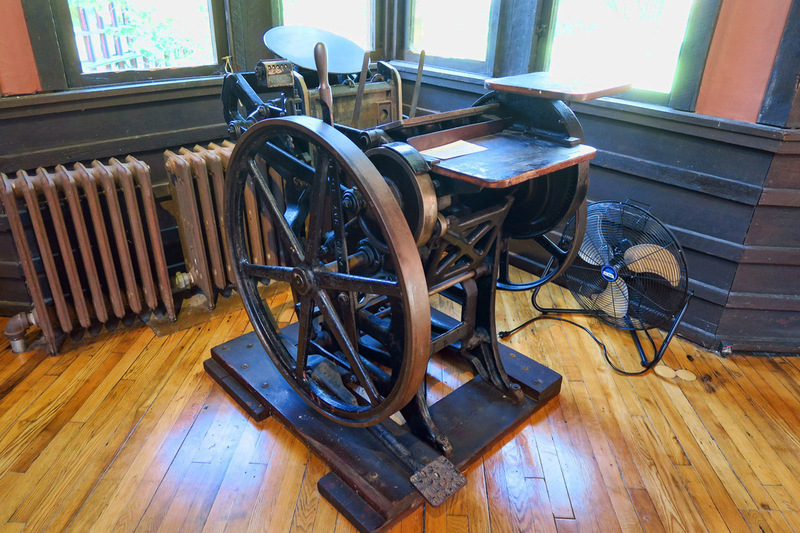 It helps give perspective that these innovative designs were built at a time when THIS was the method for printing! 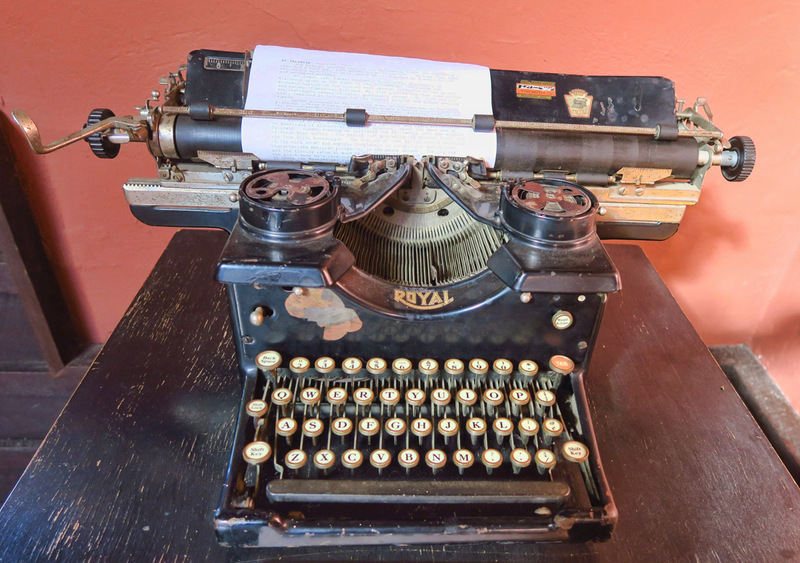 Wright’s secretary used this typewriter to produce an estimated 100,000 documents, some on display in the museum room. Notice the innovative roof line to allow light into the school rooms. The theater was added in 1955. 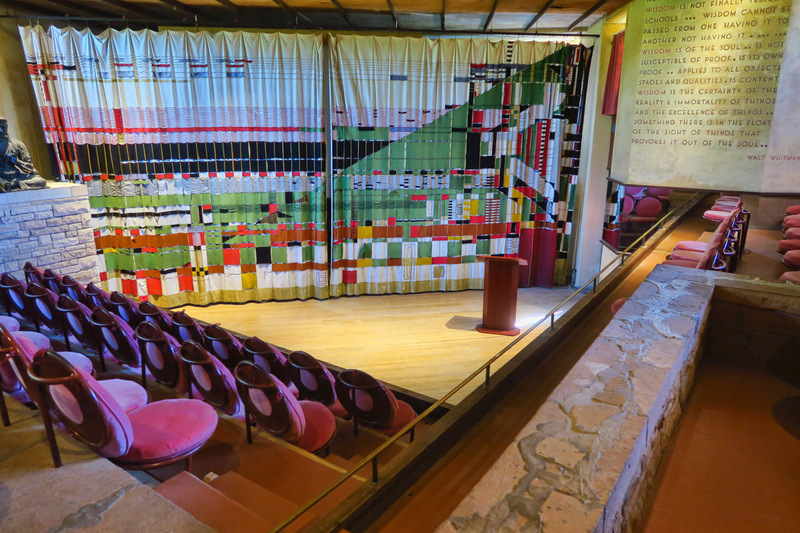 The curtain was adapted from Wright’s geometric abstraction of the Taliesin landscape, the house being on top of the angular green hill on the right, with the river below. 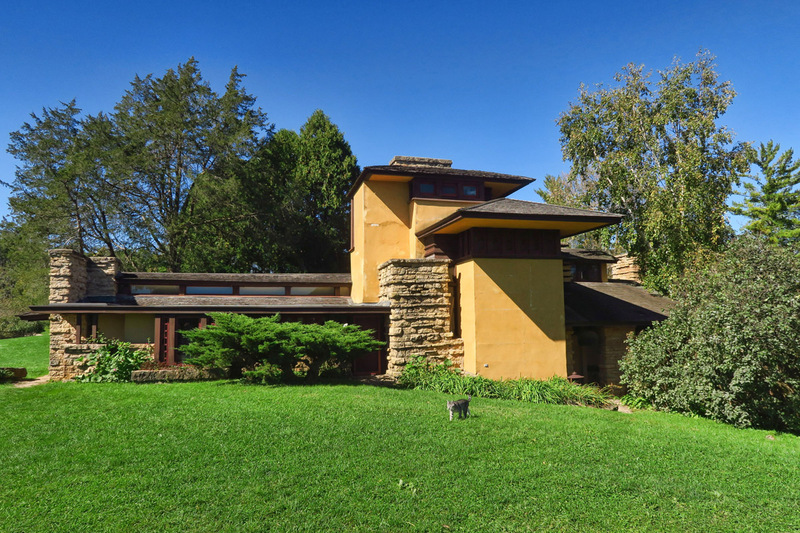 Frank Lloyd Wright has been called everything from an egomaniac to a fanatic to a genius. If you have an interest in learning more about his drama-filled life, I recommend an easy read, Loving Frank, a novel penned in the voice of his muse, Mamah Borthwick Cheney, the wife of one of Frank’s clients. Wright fell in love with Mamah in the height of his career in Oak Park, Illinois, and they absconded to Europe leaving behind his wife and six children, as well as Mamah’s two children. 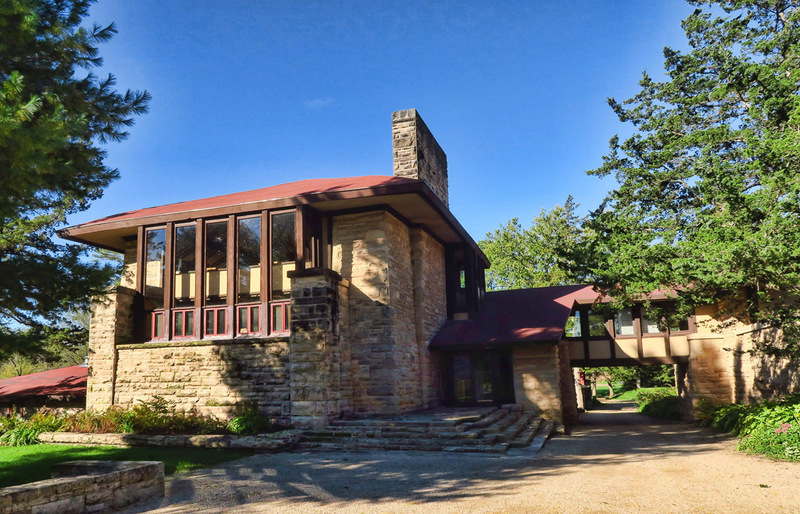 When they returned to the US, it was amidst scandal, which prompted Wright to build his home and refuge, Taliesin, in Spring Green rather than return to Oak Park, Il. 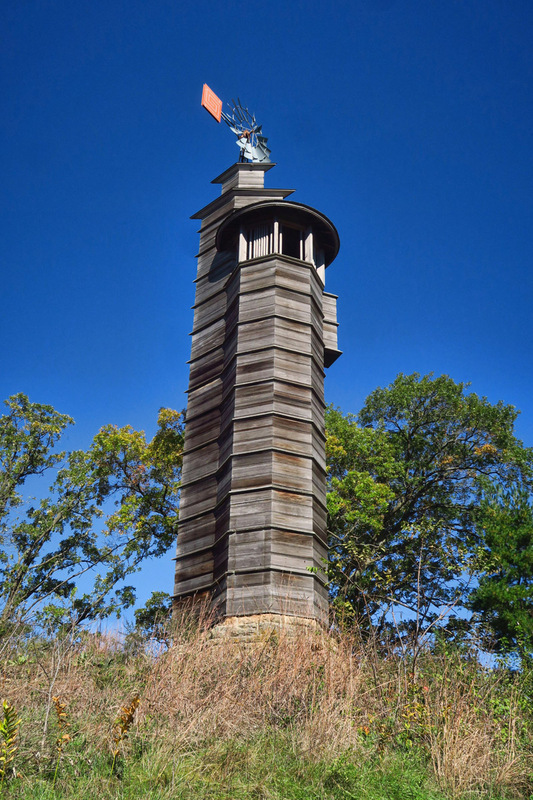 Walking up from the Hillside School, we stop at the Romeo and Juliet windmill, 1897 with it’s observatory tower of wood. Tan-y-Deri, 1907, Welsh for “under the oaks” designed for his sister. 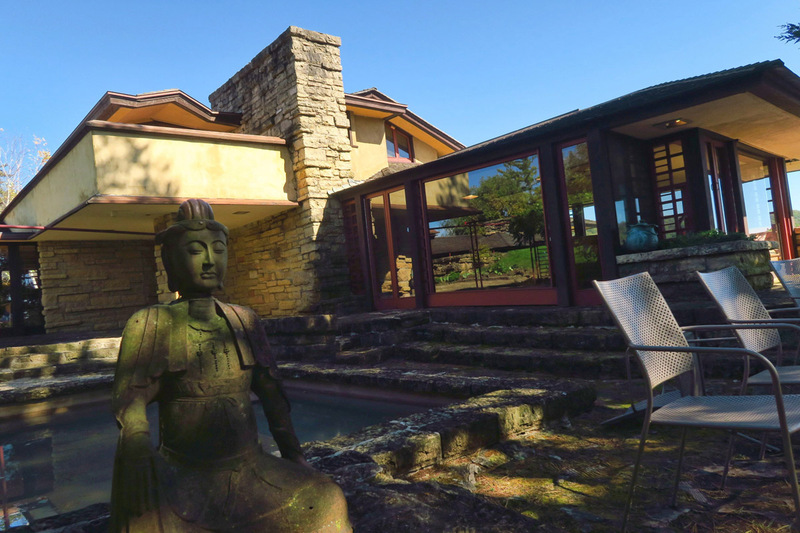 By now, Wright was beginning to incorporate some Japanese influence with pagoda-style roof. 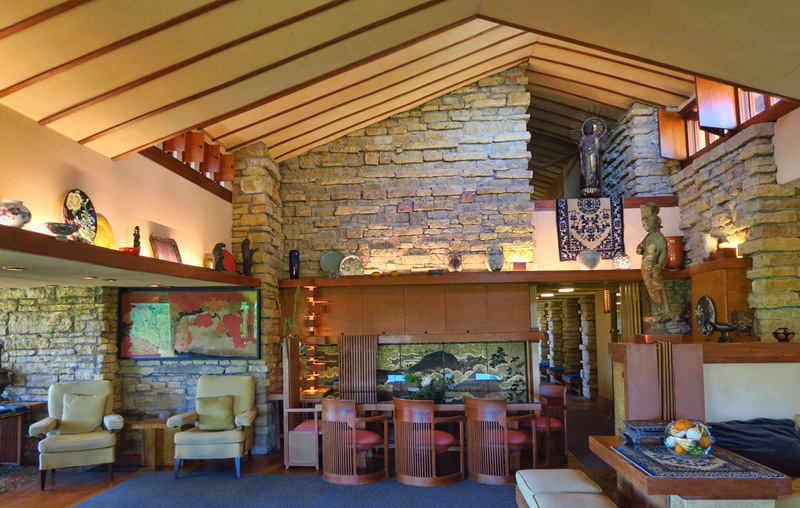 The second iteration of the living quarters, Taliesin II, was rebuilt, but was destroyed by an electrical fire in Wright’s bedroom in 1925. It was again rebuilt into the version that stands today. The thing I loved about the Estate walking tour was approaching the house on foot. 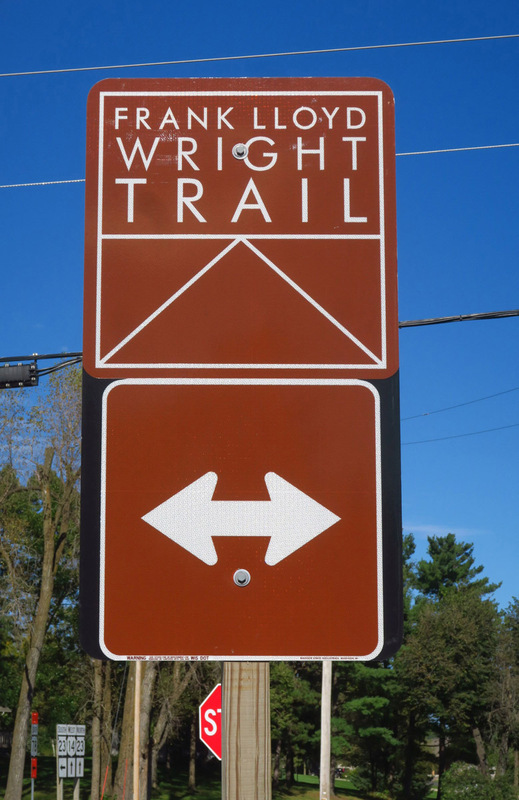 Somehow, walking toward it gave a sense of what Wright was trying to accomplish…a “shining brow” up on the hillside. 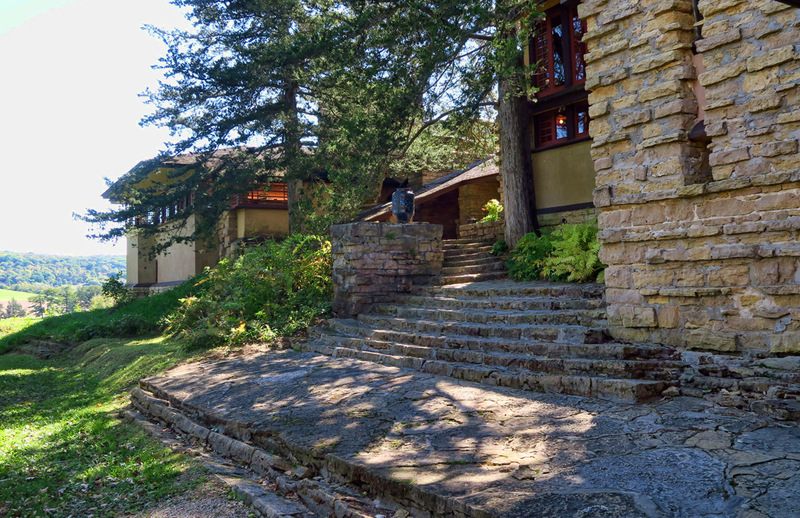 The Bird Walk featured Wright’s love of the cantilever, and allowed the wife to walk out and see the birds in the tree. 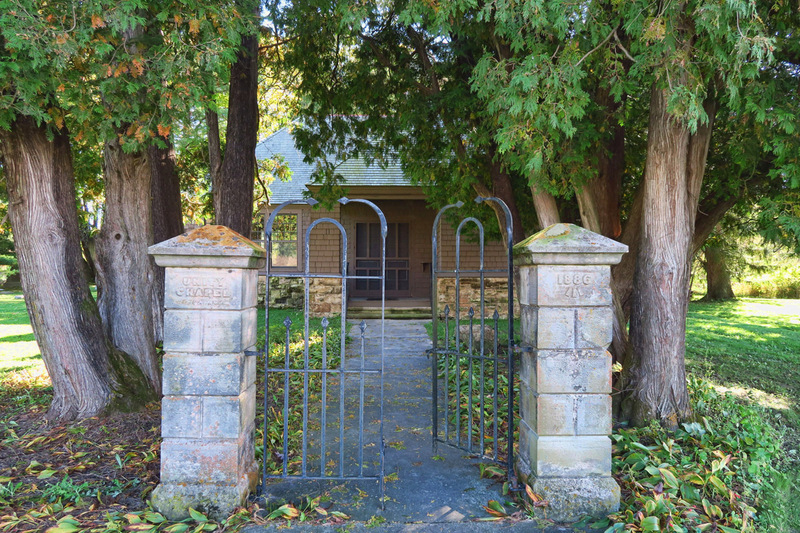 His entryways were typically a bit hidden from the front of the home. Approach from the rear section of the home, which included carriage stables back in the day. Wrights nature homes had lots of outdoor living space as well as indoor, with courtyards and gardens galore. This addition, “The Loggia” was added after the 1914 fire. And the resident cat on the lawn. 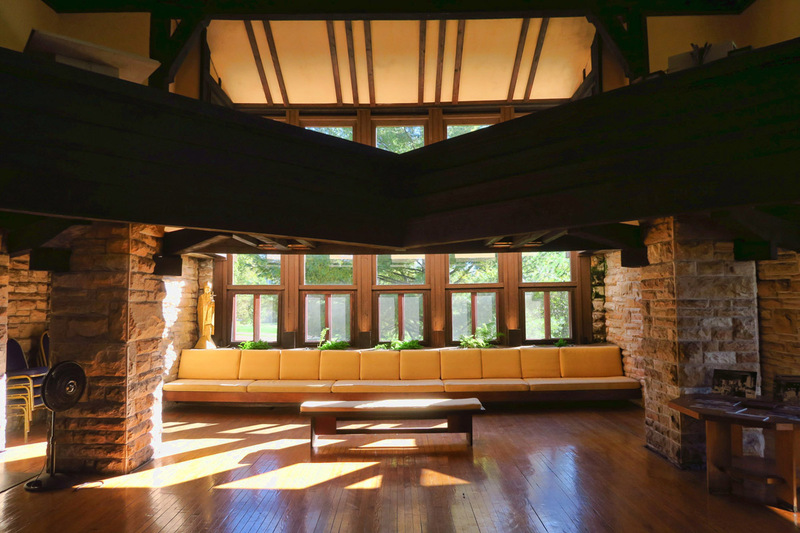 Wright’s home and workshop were considered to be a laboratory of architectural design, with innovative features far ahead of his time. He continued designing right up to the end of his life to include his most famous works such as the S.C. Johnson and Wax Building, Fallingwater, and the Guggenheim Museum in Manhattan. He died while still working on the Guggenheim commission, just shy of his ninety-second birthday. 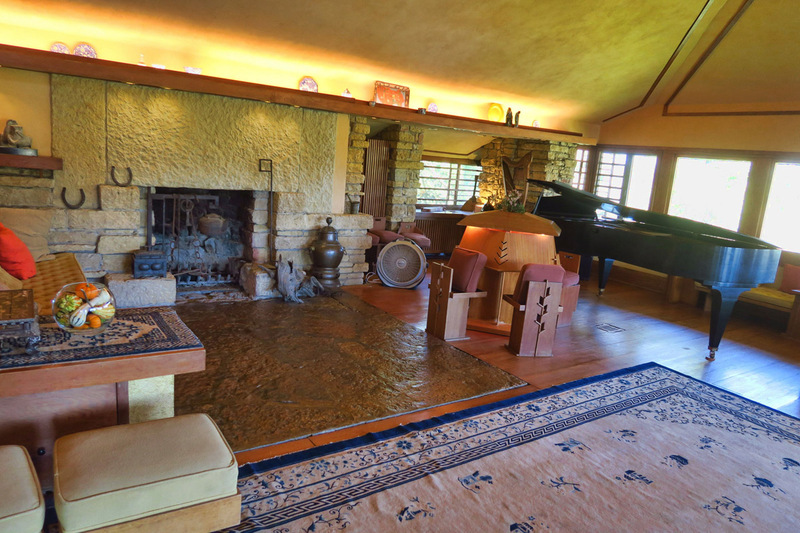 Wright often built open floorplans with living room, dining room, and music hall in the same space. The small wooden structure in near the piano is a music stand he designed for a quartet. He designed furniture for the homes as well, and often table linens and even a few dresses for the hostesses. His desk/workshop. Behind the brick wall is a big safe where he kept his prized prints obtained on his trips to Japan. 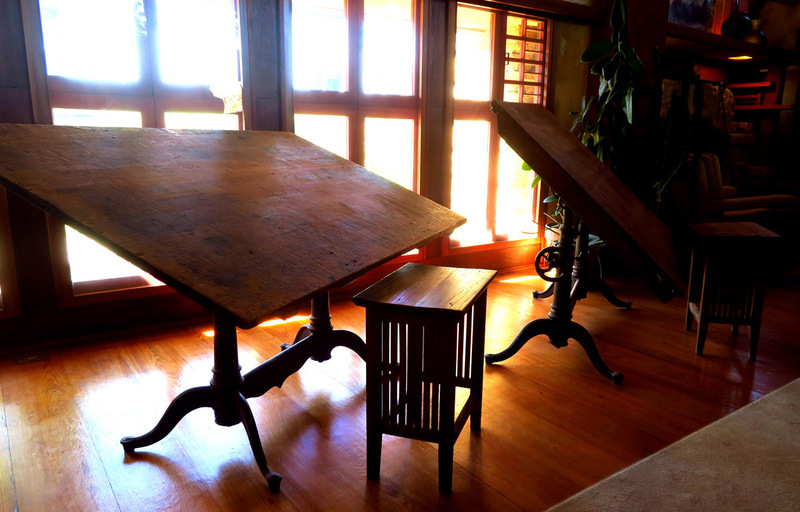 The drafting tables are his originals. 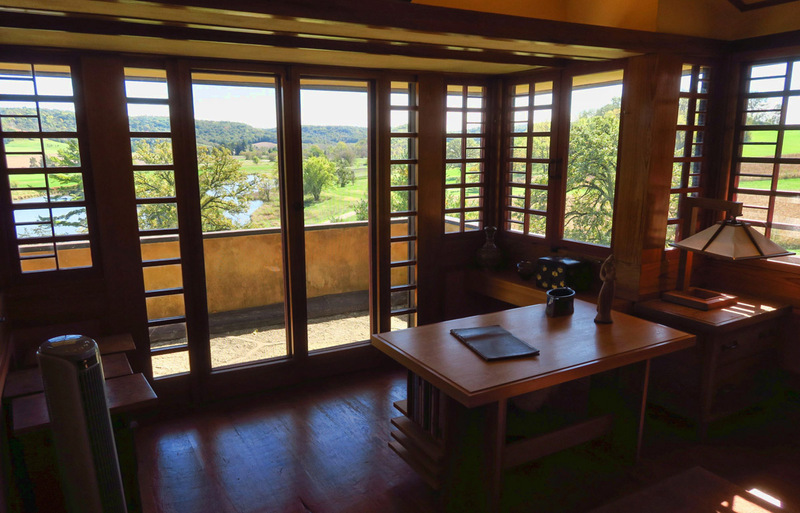 This was known as the “Oriental Room,” as it has priceless floor to ceiling Japanese artwork on the walls. Note his use of “compression and expansion,” with the low ceiling upon entry, which expands into a high ceiling in the actual living area. The wife’s bedroom. Pretty contemporary for 1925. 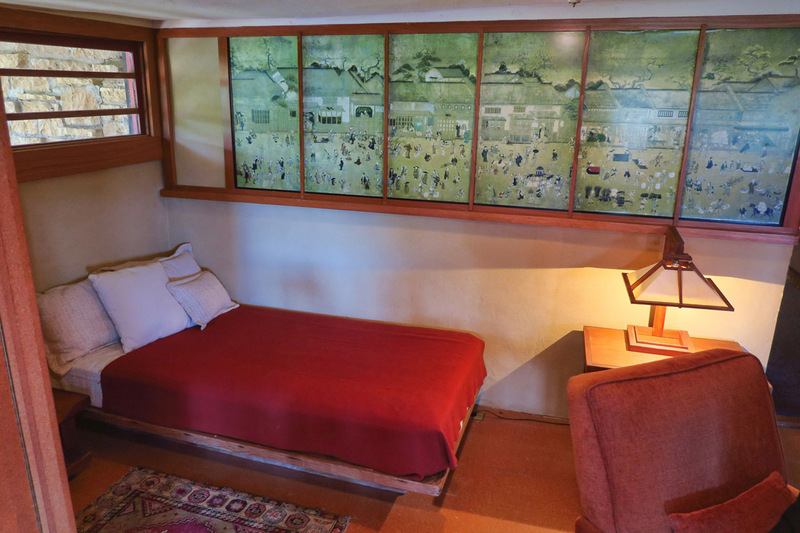 Wright’s bedroom. Gotta love that blue shag! 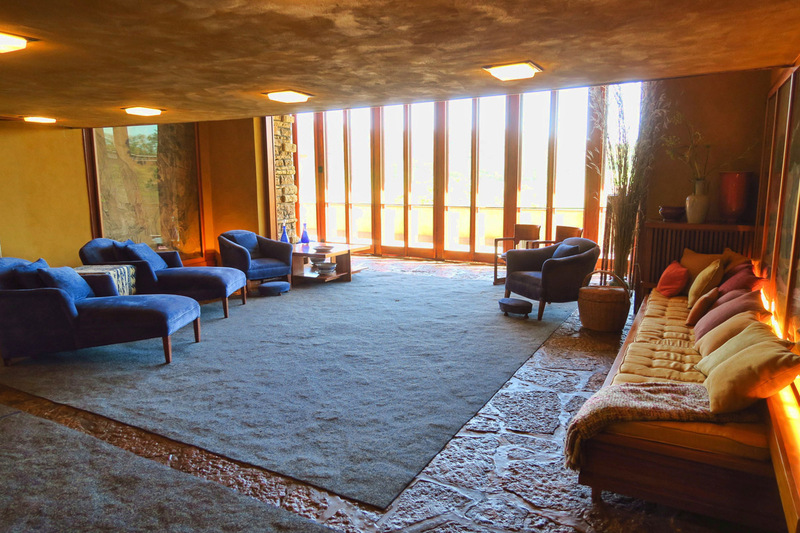 As elaborate as the whole estate is, crazy to see Wright’s simple bed. But he was reported to rarely sleep. Wright died in 1959 from complications from surgery. 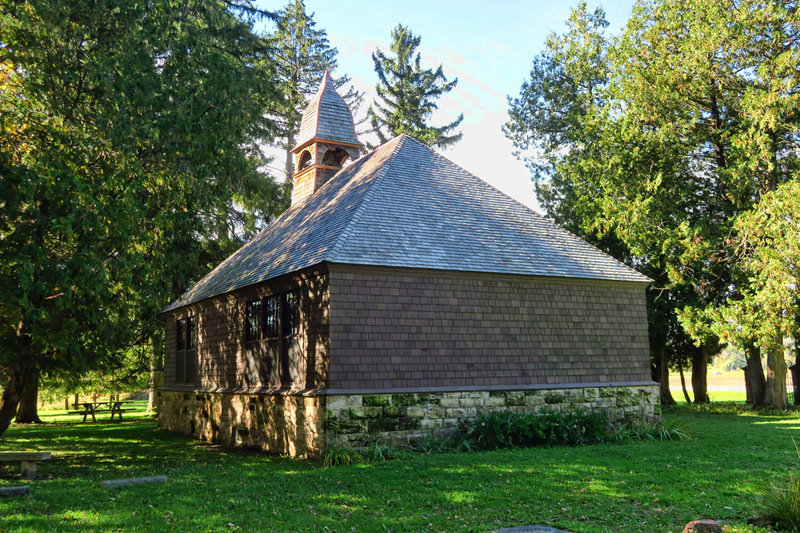 He was originally buried in the nearby cemetery of the Unity Chapel where he completed his first architectural project on the interior at 18 years old. However, his third wife Olgivanna had his remains exhumed and cremated to be scattered with hers over Taliesin West in Scottsdale. Just across the highway is the Unity Chapel, built in 1886. 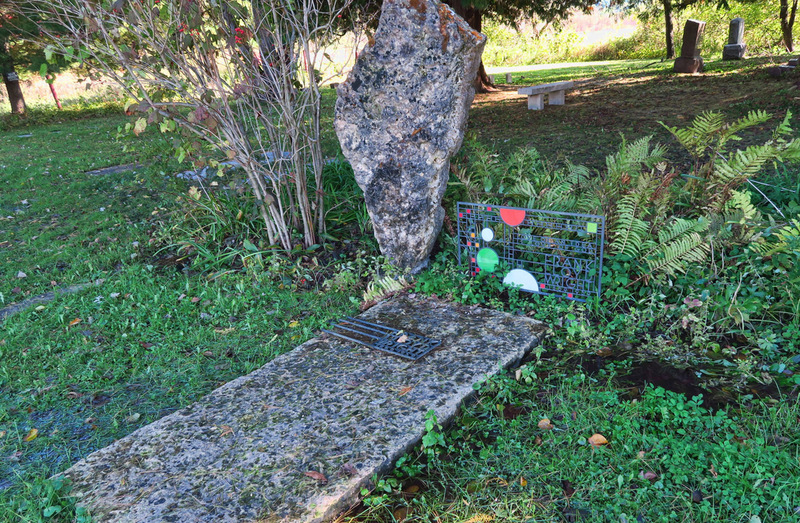 Though Wright’s remains were exhumed and cremated at request of third wife, his marker still remains. 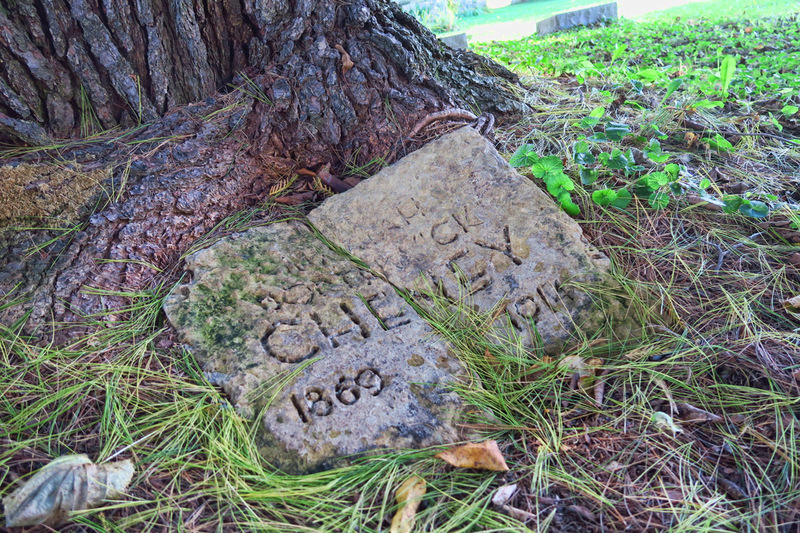 This was the only mention I was able to locate of Mamah Borthwick Cheney, the mistress and muse who was murdered. Although I enjoyed my brief time in the state of Wisconsin, and can see there is much to explore here, I am feeling antsy about making it back to my favorite spot in time for my favorite time of year. Having missed autumn in southern Utah last year due to my trip to Atlantic Canada, I am determined not to miss it again this year. So I make a solid U-turn in Spring Green, Wisconsin, breathing a sigh of relief as I cross back over the Mighty Mississippi, with the GPS set for Red Rock Country. 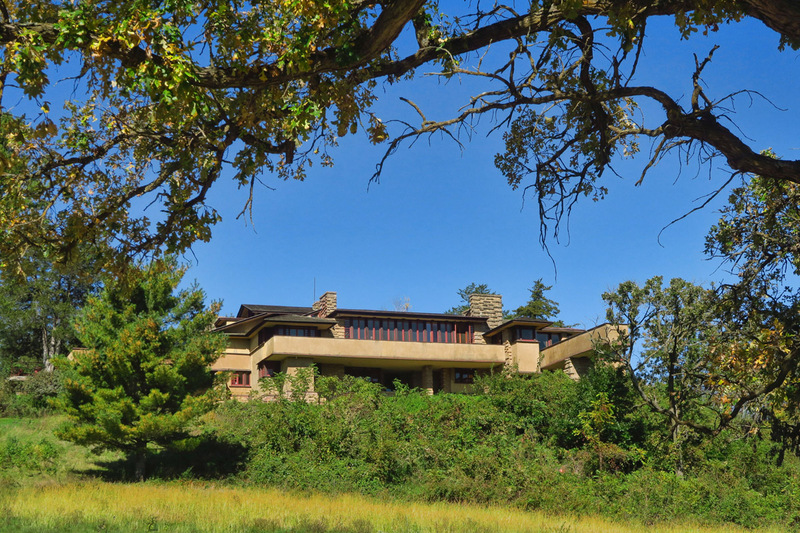 This entry was posted in Wisconsin and tagged Frank Lloyd Wright, Spring Green, Taliesin by Suzanne. Bookmark the permalink. ARghhh! You were so close to us! Just a little further south across the border. If you ever get that close again, let us know and we’ll come to meet you for a quick visit! I was always a fan myself, but never have visited any sites. (Adding to the list right now). I love how the light plays in the Hillside Assembly Hall. And if you didn’t see any birds on the very awesome bird walk, it’s probably due to that cat someone lets roam freely…grrrr…. Beautiful photos! 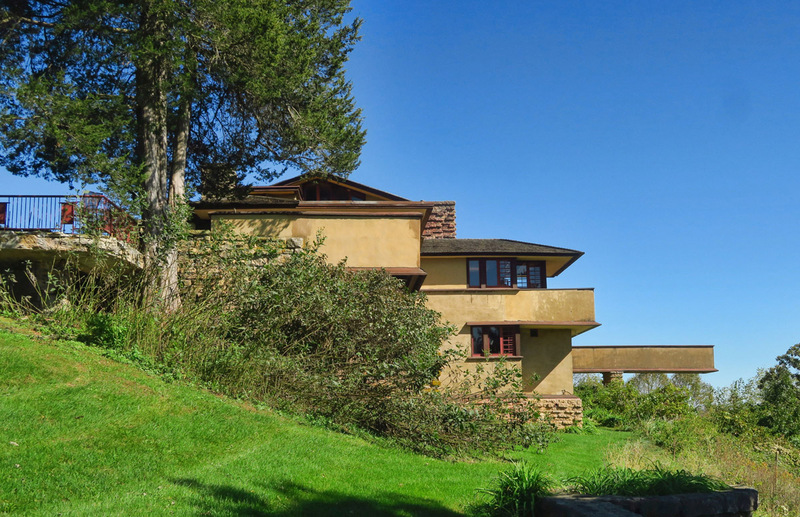 Wright’s philosophy of “organic architecture” must have seemed futuristic during the early days of his work. His interior design, featuring open spaces within linear framework, certainly has held the test of time. “Open concept design” continues to be a buzzword in home building and is an element most new home owners seem to relish. Thank you for this interesting, fact filled post about such a revered architect! Congrats on your 50th state. I think there is one of his houses in/near Springfield,IL. Timeless designs, love all the built-in furniture – like our RVs. 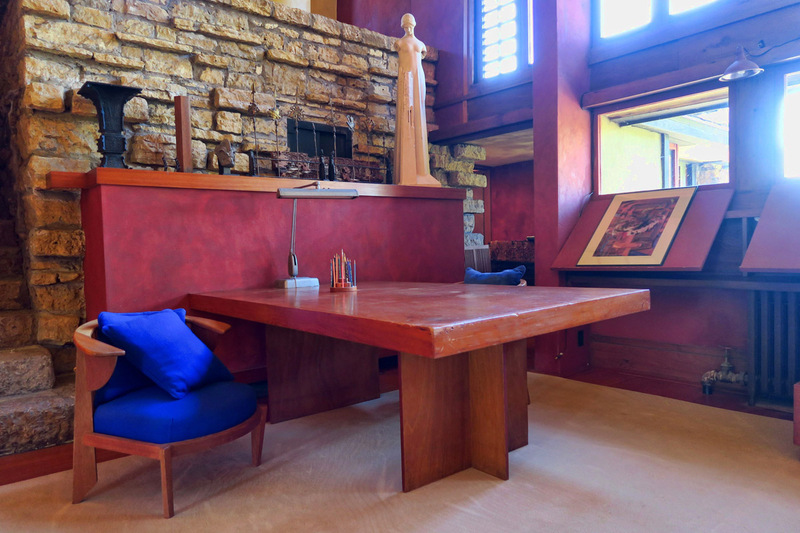 This blog is all Wright! We enjoyed it very much. Thanks. I have already read it four times. Thank you so much for the education on FLW! It is worth a book in itself. On a slow trip across the country, I ended up spending 3 weeks in Western Kansas. This part of Kansas gets a bad rap. It’s amazing how much there is to see there. Tons of quirky stuff. Try it again. I can’t wait to go back. Thanks for continuing one of the best blogs on the Internet! Thanks, Warren for such a nice compliment. You made my day! Congratulations on your achievements! And thanks for sharing your travels and insights along the way. I’ve always been fascinated by Wright. What’s next? There are 52 states you know. Happy belated birthday! Just a warning I didn’t realize how signing up for Medicare would feel like a right of passage, like graduating officially into old age! Not to mention dealing with government bureaucracy. Sure is nice to have it. I actually lost by turning 65. I was only paying $150 a month for health care with my school district. Between what Medicare takes out and the supplemental, I now pay more!! Crazy! Congrats on your 50th state. It isn’t getting you closer to Nevada!! Congrats on exploring your 50th state! We are in WI right now but near Milwaukee, where it has turned cold. I would be heading toward Utah right now too if I had the chance. 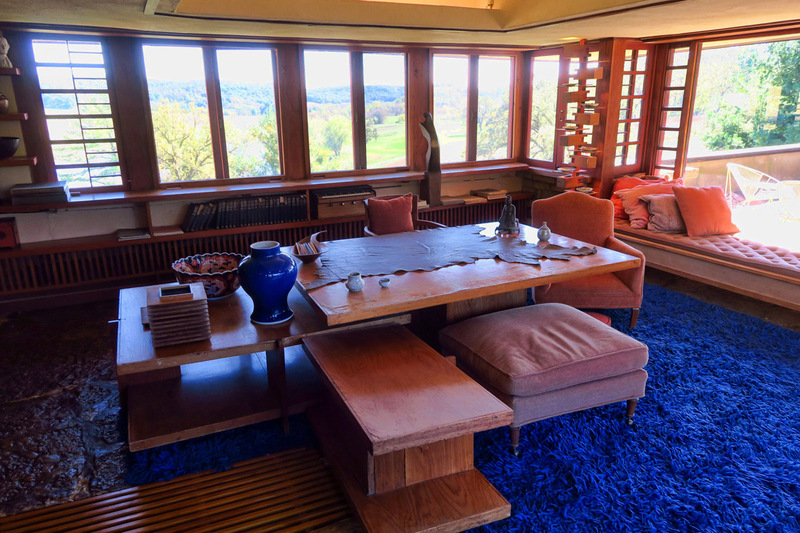 At first I gasped at the $84 ticket amount for the Frank Lloyd Wright tour, but after reading all you saw and the photos, it seemed well worth the cost. I can’t wait for Medicare! Thanks, LuAnn. Just to clarify, there are several less expensive options for touring the house, gardens, and estate. I just wanted the one that offered the greatest immersion, since I am such a fan. Stay warm up there!